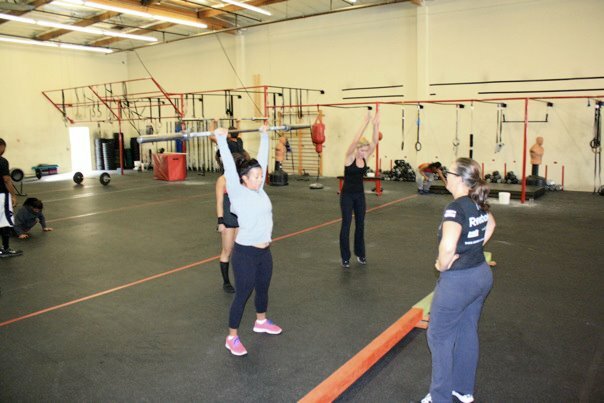 Jes' CrossFit Blog: Valley CrossFit - Round 2! 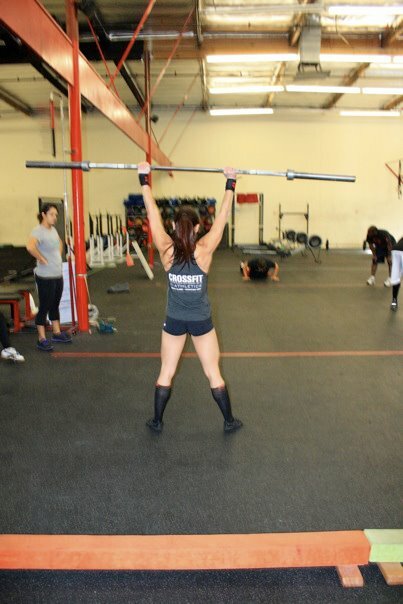 Rules: For thrusters and burpees, only 2 people can be working at the same time and barbell cannot touch the ground. It was neck-to-neck all the way, but Team Paleo Spaghetti pulled though! I had a ton of fun, tried some new things for the first time, meet some new people, and walked out with a few more tips and tricks up my sleeve. The warm up took me out of my comfort zone. It was my first time on the balance beam, climbing a 6-foot wall and cargo net, and doing a partner carry! 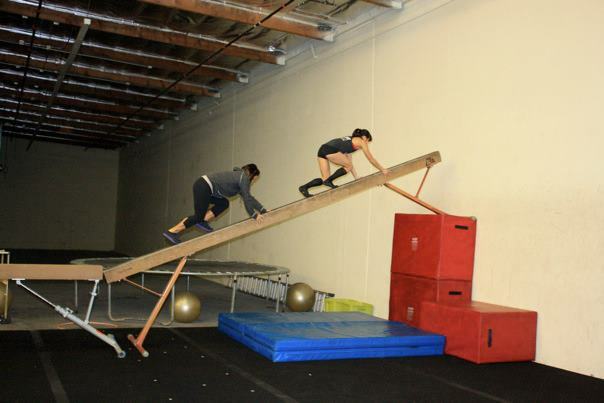 How to effectively 'climb' a balance beam. The trick is to keep the center of gravity low and balanced by doing a "cat walk." Knees almost to the beam, stretched out, and leading with the arms. I seem to have a very difficult time doing this. 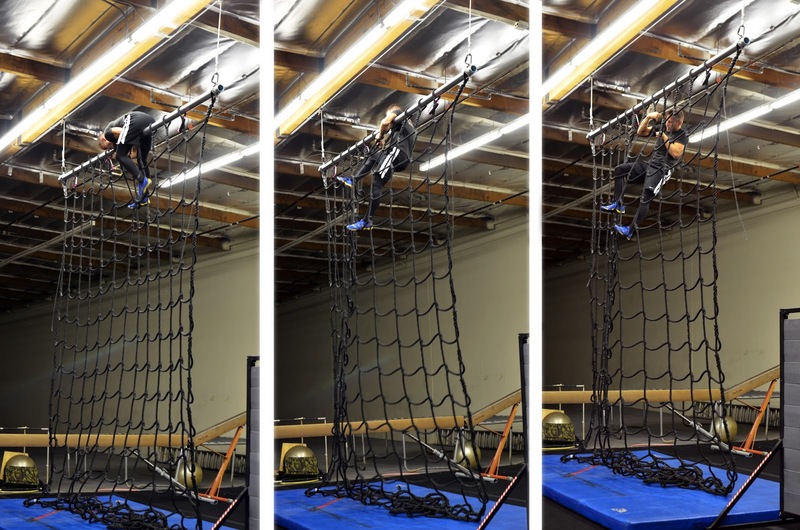 Cargo net climb: For more stability, grip on the vertical axis. Don't get too ambitious and make excessively high steps. Different ways to climb a 6' wall. Charging at it vs. jumping and pulling myself up. Translating the active shoulders and hollow rock position from the rings to the pull-up bar. Thanks Kris! New muscle-up cue: BOOM!!! Thanks Kris again! And for people with small feet (< size 6) who have a hard time finding shoes for CrossFit, Nike Eclipse 2. Thanks for the recommendation, Trixie!! Some pictures: I stole some off of Facebook. Thanks for taking pictures, Mike! 2. Poor technique on the balance beam. Hips too high = center of gravity too high. 3. Better. The cat walk. 4. Cargo net and wall climbing fun! My first time! 5. Next time I want to try going over. Pretty badass! 6. 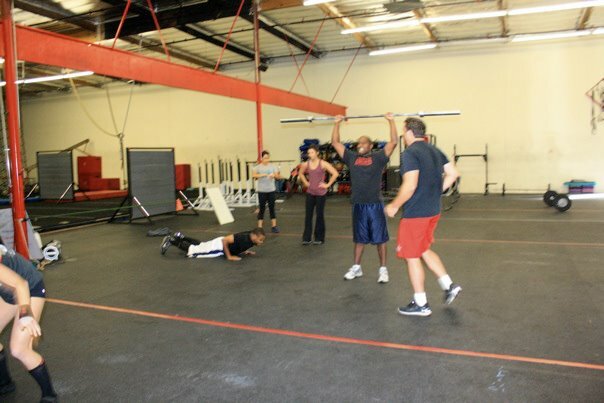 Team Paleo Spaghetti on thrusters and burpees! 7. Team Unh Unh hitting the WOD hard! 8. Hand was good enough for light thrusters. I started wearing wrist wraps after injuring it (lol another accessory). 10. Our awesome team of ladies: Angela (from CF Virtuosity), Mike as Nicole, me, and Karine! 11. Kris and I... thanks for helping me a bunch with my muscle ups!! 12. 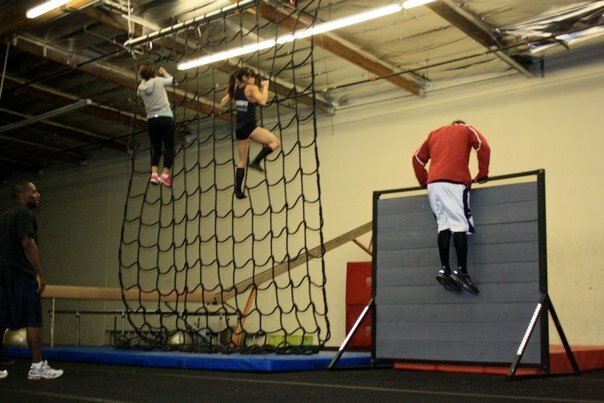 Some open gym action.. next time I want to try this!! After class, during open gym, I got to meet Kris Clever!! She was so sweet and such a great teacher! Kris gave me some of the most useful muscle-up advice and helped me a bunch with my technique! Thank you so much, Kris! Much appreciated! I missed some of the other ladies again. Next time! You know I'll be back!